Serenity Springs lived up to the name. Very serene. The surroundings and layout were perfect, the staff was over the top accommodating. I don't ever say this, but I may be going back there for another stay. Yes, it is that good! This place is amazing! From the horse drawn cariage to the breathtaking cabin. Hot tub& a fireplace we felt absolutely spoiled! “We were stunned with the amazing welcome we received upon check-in. Then we entered our cabin and both of our jaws dropped! Breath-taking! We love so many things about our stay! The butler door is a great feature! The Staff is very attentive and friendly. We honestly can’t think of anything we could improve! What a lovely place! I'm hoping we can go back when it is warmer to enjoy being outside. 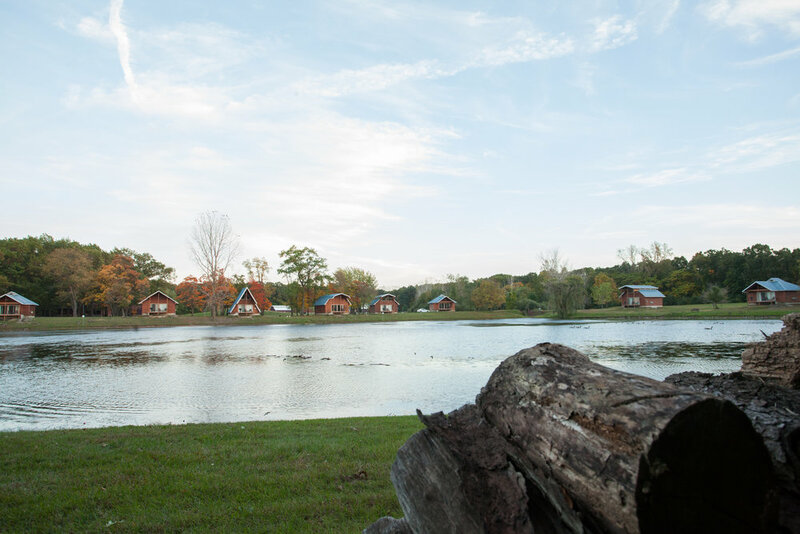 Each cabin has a nice deck with a gas firepit, facing either a pond, lake or channel. You park your car at check-in and they deliver you and your luggage by a carriage ride. Upon arrival to the cabin we were greeted at the door by staff and everything was explained to us. A butler door for service, heated floors, dvd/tv with surround sound, Jacuzzi, corn to feed the ducks and geese. Cabin was stocked with cutlery, plates, cups, salt/pepper, butter. A nice water cooler, and the fridge stocked with pop or juice, which they will ask when you book what you prefer. And they even had an Anniversary balloon and greeting card for us. There is also a grill on the deck if you prefer. Through the butler door we were provided with treats and breakfast items. Them's some HUGE muffins and delicious! Each cabin is themed and ours was #32 the Kaleidoscope cabin. Decorated by puzzles put together by someone at the resort. I know the main thing some will not like is the bathroom, with only a curtain for privacy. But when you've been married as long as we've been, it's not an issue. Turn up the surround sound and get over it! This was a spur-of-the-moment getaway for our 25th anniversary. Didn't quite know what to expect, but were pleasantly surprised. Loved the peaceful atmosphere! Everyone was very friendly. Enjoyed our candlelight dinner, took bike rides, and had fun feeding all the waterfowl that came right up to our deck. Looking forward to coming back again to take advantage of some fishing, hiking, etc! You made our day special!